The completely UNAUTHORIZED Happy Birthday Giveaway! How many times does a girl turn 49? Hopefully only this once! This is it! I am entering my last year before I turn the BIG 50! So, since I have absolutely NO CLUE as to what is expected at this ripe old age, I decided to have a GIVEAWAY! That is unexpected and really quite lovely for me ( I LOVE sharing great stuff) and hopefully for you too! To make this a fun and unique opportunity, a brand NEW Aurifil collection has been created. This is a completely UNAUTHORIZED collection of my own making from the bins in my sewing room. I looked through all the colors and weights and decided that this collection would contain the best of all worlds! A combination of weights ( included are 50wt, 40wt 28wt and 12wt), colors and even some FABULOUS variegated! This way you can try so much in one GORGEOUS thread box. The bottom row alone is giving me chills! Say "HELLO GORGEOUS!" 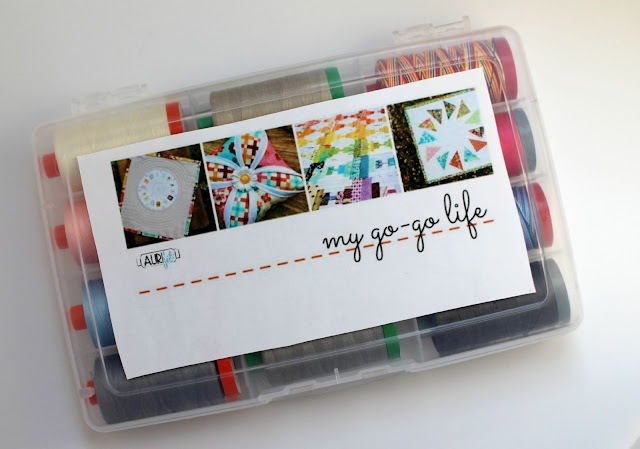 to the My Go-Go Life Aurifil ( did I mention it is completely unauthorized) collection! Look at this!!!! Makes me SO HAPPY!!!! And as if that were not enough...I will be adding in a small spool collection of Frances Newcomb's Treasure Chest and three mini charm packs! The grand finale, is an Aurifil color card with ALL 270 lush colors so you will be able to match up the perfect threads to every project! That is a whole lot of AMAZING stuff you can win!!!! I will be using Rafflecopter for the giveaway to give you a few options to make it easier for you to enter and for me to be able to contact the random winner! This giveaway is open internationally since I LOVE all of my awesome international friends :o) I would love it if you could share it with all of your friends too ;) Repost, retweet, relove :o) Happy Birthday to me and I am sending GOOD LUCK wishes to you!!!! Happy birthday to you, happy birthday to you, happy birthday dear Kim, happy birthday to you!! Happy birthday,life does get better in the 50,s. Happy Birthday to you. Thanks for gifting us on your birthday. Happy Birthday, Kim! Thank you for giving to us on your birthday! May all your wishes come true! Christmas in July is seriously the best day to be born. Happy birthday to you and me! Happiest of Birthday wishes to you ") Your collection is lovely indeed! Happy Bday!! Hope you have an awesome day! This is a gorgeous collection of yummy colors!! Happy Birthday! Hope you have a special day planned. Thanks for the chance to win. Happy Birthday! It's just a number! 49 is the new 29! Happy Birthday Kim! I'm a July girl too! Happy birthday! I hope that have a great day and thank you for sharing with your readers, so generous. Happy, happy birthday! I've been following you since I saw your cathedral windows tutorial years ago. Love your stuff! FYI: every decade gets better and better. I turned 55 this year! I think my teenagers keep me young (and sometimes frustrated!!) Enjoy your day and the last of the 40's. It's a good thing! Happy Happy Birthday!! As one about to celebrate a double nickel birthday, I can say that life gets better with a little mileage on it. You learn what's important and appreciate it a little more. Happy Birthday and have a great day. I woyld love that aurifil thread card. Happy Birthday! You don't look a day over 30! Wishing you a delightful birthday! Happy Birthday, Kim! How generous of you to give this wonderful gift celebrating your birthday. Happy birthday, Kim! ♡ I hope you have a fantastic year of celebration! Happy Birthday!! 49 is not so bad!! Thanks for the chance to win!!!! Hope you have the best birthday ever! Happy Birthday! Have a wonderful day with cake, presents and all your lovelies! Thank you so much for this chance to win! Happy birthday, hope you have a wonderful day. Happy Birthday Kim. Enjoy 49, but don't worry, the 50's are great too! Wishing you a Happy Birthday with many more to look forward to. Thank you for the opportunity to enter your give-away! Perhaps I might win…keeping my fingers crossed. Happy birthday! Hope it is happy! Happy birthday, Kim! I hope you have a wonderful day! A very happy birthday to you! Such a fun, colorful selection of threads you have put together. Happiest birthday wishes to you! Wishing you a wonderful birthday full of fun and fulfilled dreams! Happy Birthday and many happy returns! Happy birthday! I'm a July birthday too! Happy birthday! And by the way, Aurifil thread is the best!!! Birthdays are the best. We celebrate a whole week around birthdays. Favorite foods, special desserts, dinner at your favorite restaurant, and lots of special surprises....'cause birthdays are special and all about YOU! Have a wonderful Happy Birthday! Happy birthday, Kim. All the best today and all year! Happy Birthday! Have a fabulous year! Happy birthday! My husband was so thrilled when he turned 50. Although you have one more year, think of what an accomplishment it is to get this far in life. Amazing!!! Happy Birthday, and hope all goes well!! Enjoy your last year of 40's! But remember, the best is yet to come! Happy happy Birthday! What a great gift you created. Your coming into the best part of life, enjoy! Happy Birthday !!! I hope you have a wonderful day today and many more!! Happy Birthday Kim!!! Enjoy your special day!! Thanks for celebrating with this awesome giveaway!!! Happy Birthday Kim! I hope your special day is filled with happiness, joy and love. I will be 53 on Friday the 31st and let me tell you I am having the best time of my life! Here's to the next milestone you will cross!!! Happy Birthday and thank you for the opportunity to win these wonderful quilting supplies. HAPPY BIRTHDAY, KIM! I hope your day is filled with lots of joy and presents. Happy Birthday! Fyi - I just celebrated the 5th anniversary of my 49th birthday! Happy Birthday from Oregon! Welcome to the next 50 years! Enjoy! AND, THANK YOU for the giveaway...how fun! you are entering the best years! Enjoy your last year of being fourty-something! Although who's gonna say something if you remain 49 for a few more birthdays? Thanks for a spectacular giveaway. Love,love, love the Aurifil colors you selected! Happy birthday to you! Thanks for the awesome giveaway! Happiest birthday celebration to you! Thanks for the "awesome" giveaway too....I adore Aurifil thread. Happy Birthday! I'm not too far behind you. :) Hope your day is wonderful! Happy, happy birthday to you! May the best be ahead of you this year! Thanks for a chance in your unique giveaway--what a great idea! Your choice of colors is awesome! Happy Birthday! I hope your day is filled with love and laughter! Happy Birthday! And thanks for the chance to win the great thread selection. Happy birthday!! What a fabulous collection. Happy Birthday! Have a wonderful day! Thank you for the generous giveaway. Fresh, happy colors - what a delight for creating! A very happy birthday to you ! Have a great day and sew something special for yourself. Happy birthday, enjoy being 49 but look forward to 50. Happy Birthday! Thanks for the wonderful Giveaway!!! Happy, Happy Birthday Kim dear! Fun things will come to you all year! If I had one wish, then it would be, Happy Happy Birthday to you from me! Thanks for such a generous giveaway. Fun, Fun, Fun! Happy Birthday! what a generous and beautiful give away on your special day. Thank you! Forty-Nine FOREVER!!!!!!! So glad to have found your blog - super fun and makes my eyes SMILE! Happy Birthday I hope it is filled with, family, friends, love, and most of all fun sewing! Lovely thread collection!! Happy Birthday! The best is yet to come! Thank you for this gift to others for your birthday! Happy Birthday and may you have many more. Happy birthday! I love how you celebrate! Happy Birthday! Thank you for a chance at the giveaway! Happy Birthday Gorgeous. What a wonderful collection. Very nice. Have a beautiful and fun filled birthday! 49 Happy happy joy joy birthday wishes to you! Happy Birthday Kim! Have a great one! Happy Birthday! I love this guveaway! Happy Birthday, go all out, 49 only comes around once!!!! Happy Birthday - thanks for sharing your birthday with us. Happy Birthday!! I hope you have a lovely day and your back feels better! A very happy birthday! What an awesome idea! What fun! Happy Birthday! Great thread colors and what a lovely generous idea! Happy Birthday and thank you for the chance. Hope you have a fantastic birthday and all your wishes come true... As for what comes after 50... birthdays become just a number as you are as awesome at 50 as you were at 25 just a little bit wiser.. Happy birthday. Thanks for giving us a present on your birthday! Have a wonderful happy birthday!!! Happy Birthday and many good wishes to you. Wow, this is awesome! Would love to BUY this set of goodies. Happy b'day to you---many blessings for a great year! Happy Birthday!!! Hope 49 is all you want it to be. But don't fear 50 - a friend told me that when she turned 50 she decided it was okay to say "no". Very freeing! Many thanks for sharing all of these lovelies with us! Thanks for the opportunity to win your beautiful and generous giveaway. Happy,happy birthday. I hope you get at treaT as nice as the one you are giving away! Happy Birthday! Have a wonderful day! Happy birthday. I love birthdays! Happy Happy Birthday! You're in the prime of your life! Happy Birthday! And many more. Thanks for sharing the LOVE. Happy birthday and thanks for the giveaway!! Happy Birthday. Thank you for the amazing giveaway! Happy Birthday to you-again :-) I hope it is a wonderful day followed by an even more wonderful year. Happy Birthday!! Remember 50 is the new 30 so it should make you younger soon. Happy 49th. 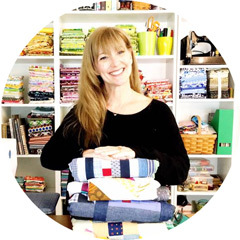 May your 49th birthday be as awesome as Aurifil. Enjoy your Special Day, Kim!!... And *thank you* for letting us in on your celebrations! Best wishes, Kim, for a Birthday... and coming years!... filled with family and friends, laughter and love!!!! Wishing you an awesome birthday week! Super fun collection. Happy Birthday-May the thread be with you! Happy Birthday!!! Thanks for the great giveaway! Age is just a number, don't sweat it. Happy birthday! This giveaway reminds me of when I used to give presents to my friends for my birthday. Happy Birthday! What a lovely way to celebrate! Happy Birthday! Your box is making me happy today too! What a fun thing to do. I hope your day is filled with thread, fabric, yummy food, fun people and anything else that delights you! Hope you're having a wonderful birthday!! Happy Birthday! I like to celebrate hobbit style too, it reminds me how lucky I am to have spent another year with my favorite people. Have a great year with your favorite people. Happy birthday from one July birthday girl to another! Mine is at the beginning of the month and I have been celebrating all month long. Hope you get to celebrate a long time, too! Happy happy birthday to a fellow Leo! Happy 49th Birthday! I just hit that milestone last week myself. Happy BIrthday to you - July is a lovely month to celebrate!!! Happy 49th, Kim, and may you have many many more! Happy birthday and thanks for the great giveaway! Happy Birthday hope it is wonderful! Wow, what a wonderful way to celebrate your birthday. I hope you had a wonderful day. Happy Birthday! I hope you have a blessed day and year! Happy Happy Birthday!!!! Turns 50 isn't bad...It is only a number! Thank you for the chance to receive the awesome thread collection. How lovely and happy birthday - I turned 50 this year - and its been great! Happy birthday! It's awesome you give other people presents for your birthday! Hope it's great! What a fun giveaway! Thanks so much, and Happy Birthday!! Happy Birthday. Hope you have many more to come. Happy Birthday! Hope your day was filled with good food and great friends! Happy Birthday! I hope you had a wonderful day, and will have a fabulous year! You have excellent taste in thread! I do love the box you designed. I think you need to get an authorized mix of colors and weights. Happy Birthday! and many more! Happy birthday and thanks for celebrating wiyh us! Happy Birthday! I have you beat by a year!!! Happy Birthday - I love love love aurifil thread - just as much I enjoy seeing creations that everyone shares. Happy happy birthday! How kind of you to celebrate by sharing a giveaway with the community. You sure know how to throw a beautiful party! I love the box that you curated. Have an absolutely awesome birthday! And thanks! Happy Birthday Kim. It only gets better from here. Have no fear.